They set out on New Year’s Eve to toast the start of 2010 with a pint with some friends in their local pub. But for revellers at the Tan Hill Inn in the Yorkshire Dales, the celebrations lasted somewhat longer thanks to the heavy snow. 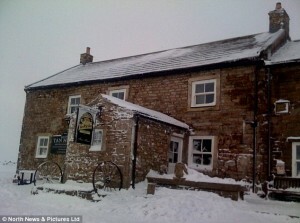 The drinkers ended up snowed in at the pub – which is the highest in England in terms of altitude – for three whole nights after the wintry weather left them stranded. 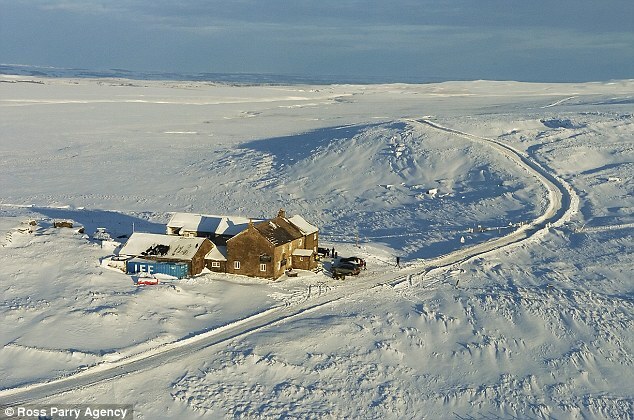 Snow was 7ft deep in places around the pub as the big freeze refused to relinquish its grip on Britain and in particular the north and Scotland. Fortunately, given the location, the group were not too distraught not to be able to go elsewhere thanks to the plentiful supply of food and drink available. They were finally able to head off home – presumably with very sore heads – this morning after gritters and snow ploughs made the roads safe. Leeds University Cross Country Club organised their New Year’s Eve party at the pub, but some of the intrepid thirty party-goers had to abandon their cars on the A66 as they battled through hazardous road conditions. Student Nathan Martin, 26, from Huddersfield, said: ‘We were meant to have a barn dance, but it was too cold in the barn so we stayed in the pub. Despite not being able to get out, we’ve had a good time. There’s been plenty of real ale, but now the Black Sheep and Theakston has run out and there’s only Black Sheep Riggwelter left on tap. ‘There are about thirty of us in total in the pub – and we’ve all been mucking in helping with chores like washing up and there’s been a pub quiz every night which has helped to keep us going. ‘It’s been fun – it’s like the ultimate lock-in really. We were meant to be leaving on New Year’s Day, luckily we’re not really in a rush to go home. ‘One girl had an asthma attack though but fortunately she was OK and managed to get out when a convoy came. 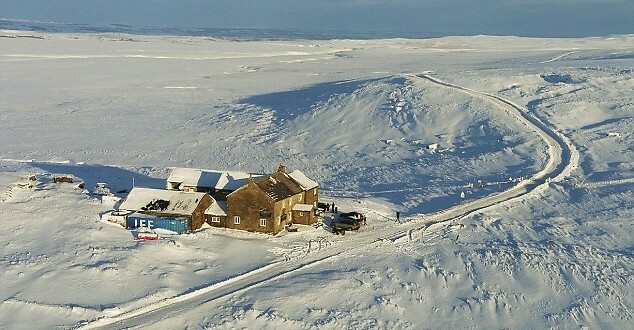 It is the highest inn in England occupying a point at 1,732 feet (528 m) above sea level. Peter Richardson, 47, a DJ from Richmond who was hired to play there, said: ‘We kept on hearing that a snow plough was on its way, but apparently it’s definitely coming today. People don’t seem to mind though. Everyone’s been helping out. The snow outside the pub itself is about 2ft deep, but the problem is with us being so high up, the drifts really affect us. Snow has been drifting constantly and it’s 7ft or more in places, meaning we couldn’t get out. Locals with a 4×4 had ferried in drivers stuck on the A66 between Bowes and Brough to the pub. Tracey Daley, 45, who manages the old drovers’ and shepherds’ outpost above Arkengarthdale on the Yorkshire-County Durham border said: ‘A really nice atmosphere developed as the party went on. Afew friendships may have started. Tan Hill takes in an orphaned lamb after his mother dies giving birth.